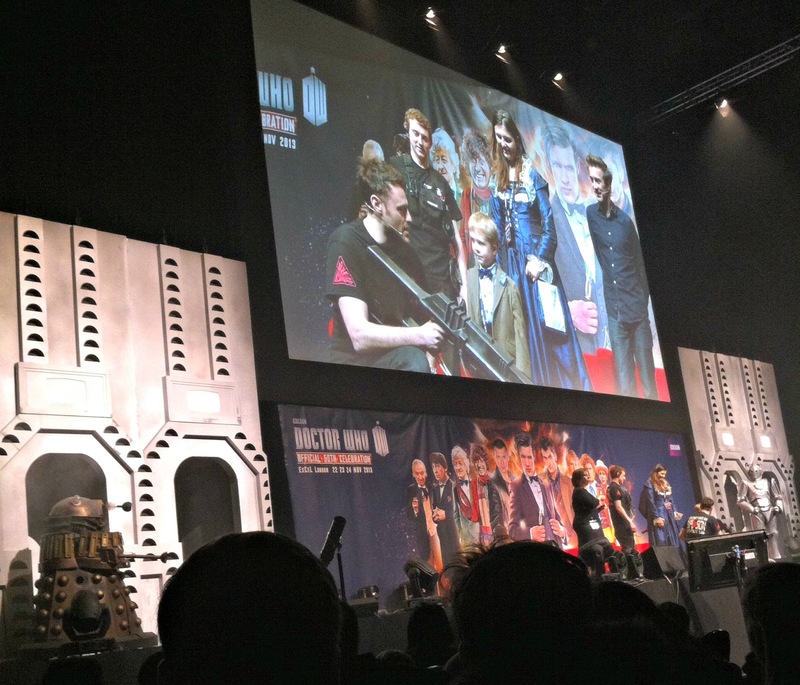 Back in November we got our geek on in a big way and went to the official Doctor Who 50th anniversary celebration in London on the best day possible, the actual anniversary! 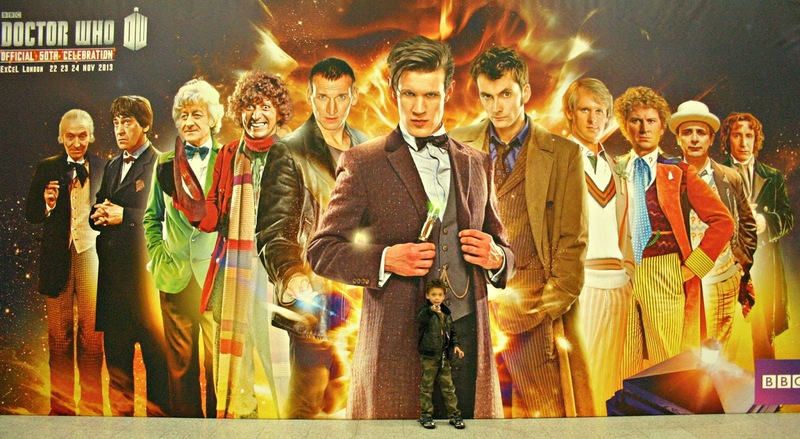 Lucas and I finished our marathon viewing of classic Doctor Who just in time--phew! We drove up the night before--oooh-ing and aahh-ing at all the gorgeous Christmas lights--and met up with our friend Brian who'd come over from the States for the show. Which is pretty impressive since he'd been watching Who for less than a year at that point!! Saturday morning dawned bright and early. We were all up and foraging for breakfast at half past seven which was an epic failure. In hindsight, we should have had the hotel breakfast as we didn't manage to eat until about eleven. So, what did we do instead of breakfast? Dear Reader, in the greatest of British traditions, we queued. Which is pretty much how the rest of the day went. 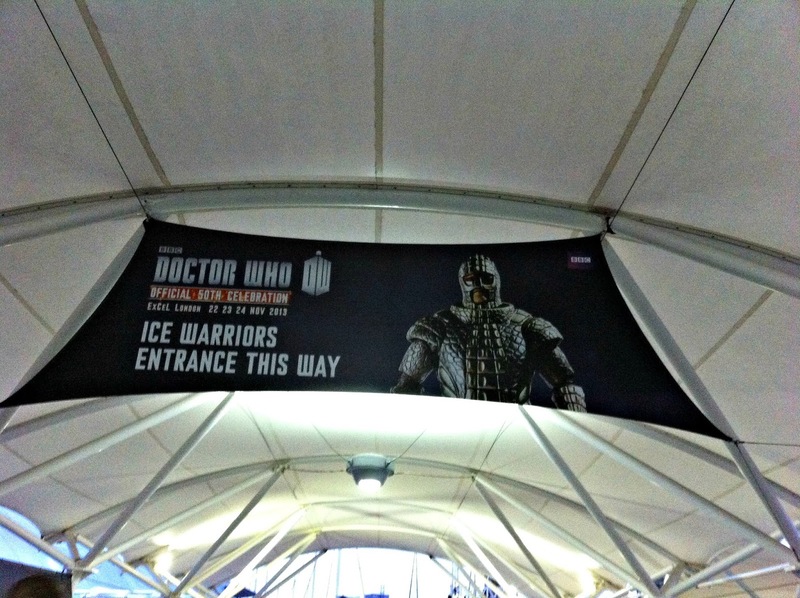 Still, because this was a queue full of Doctor Who fans, it was pretty cool! 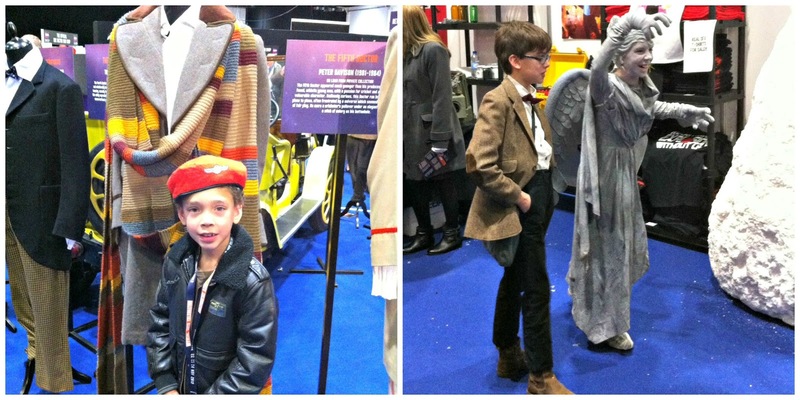 Girls in TARDIS dresses twirled around, we saw every incarnation of The Doctor cosplayed, there were bowties and fezzes galore, members of the Gallifreyan High Council queueing as politely as all us commoners, and also several UNIT soldiers including a rather awesome Brigadier! 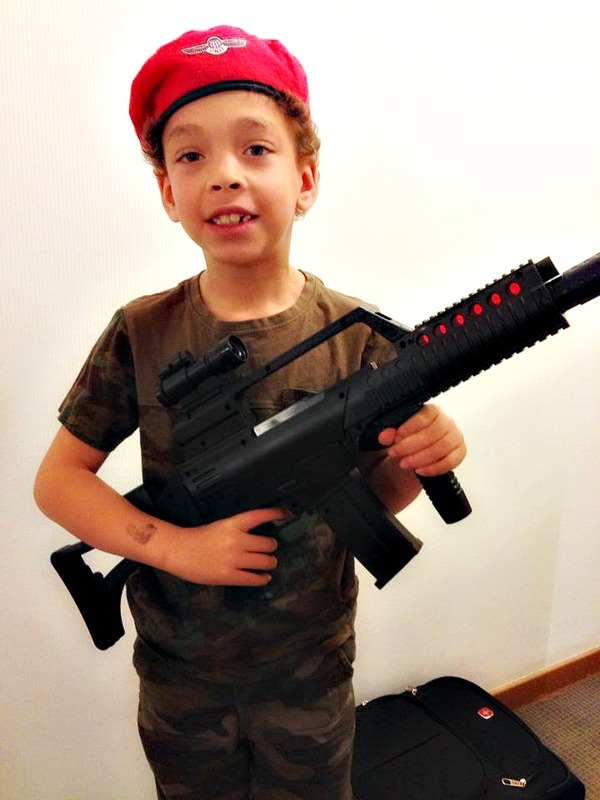 Lucas did a little bit of cosplaying, but unfortunately he got all shy when he saw all the grown-ups dressed up and refused to pose or carry his own gun. Poor Dave ended up walking around all day with a machine gun sticking out of his rucksack! Doesn't he look cute? And in proper Army tradition, he's sporting a tattoo on his arm--of the baddie from Cars 2 rather than naked ladies, though! 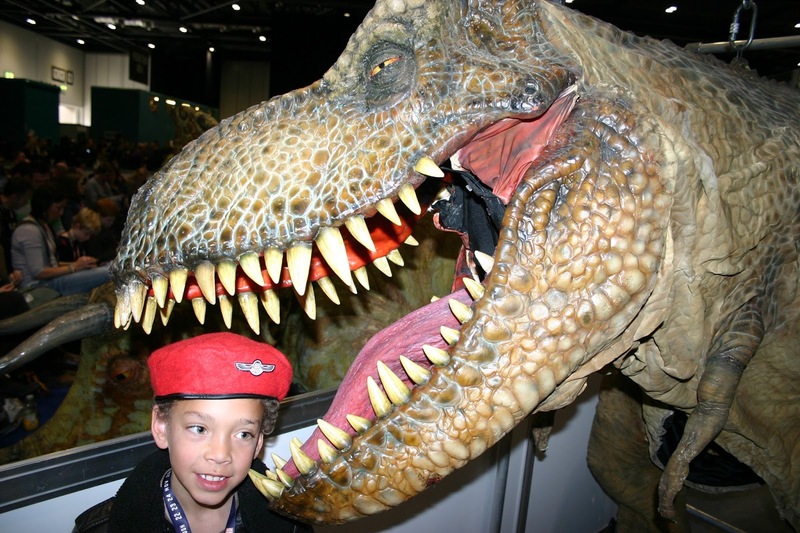 The first event was the Special FX show, which Lucas and I loved. 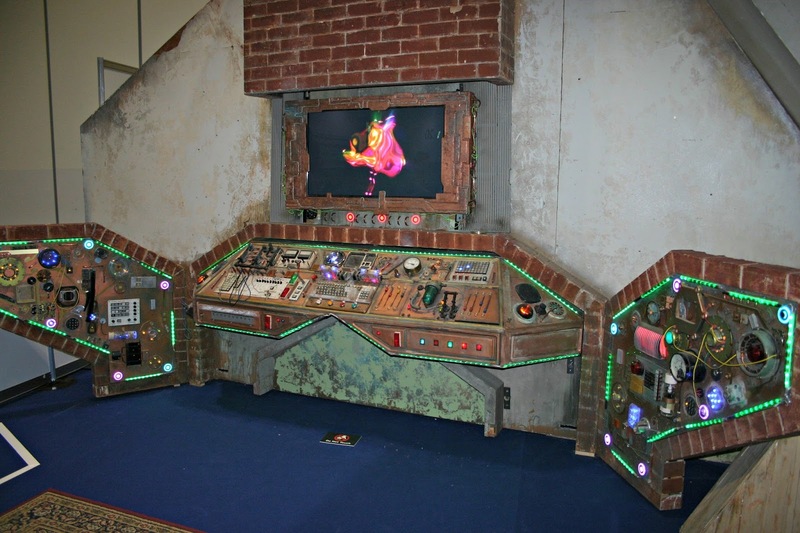 It was hosted by Dallas Campbell who we'd spotted earlier while we were queuing and Danny Hargreaves who creates all the physical effects for Doctor Who. So, exploding Daleks--the break-away Dalek is a very cool concept--snowstorms indoors, shooting Cybermen and lots of interesting anecdotes about his time on Who since the reboot. My favourite anecdote was from the filming of the Eleventh Hour--the first Eleventh Doctor story--and Danny gave the sonic screwdriver a little too much juice resulting in large sparks and the Doctor sucking on his burnt thumb. It was totally unintentional but it looked cool so they kept it in. Afterwards we all poured out of the exit and up the escalators to the main convention hall. I looked back and there was an absolute sea of fans behind us, milling around and jostling for space on the escalators and stairs. It was only then that it hit me...this convention was HUGE! Especially, since I was only seeing half of the attendees! The crowd carried us along until we suddenly found ourselves walking along a somewhat psychedelic carpet and through a giant, wood-panelled TV set into the black and white world of Trotter's Lane. 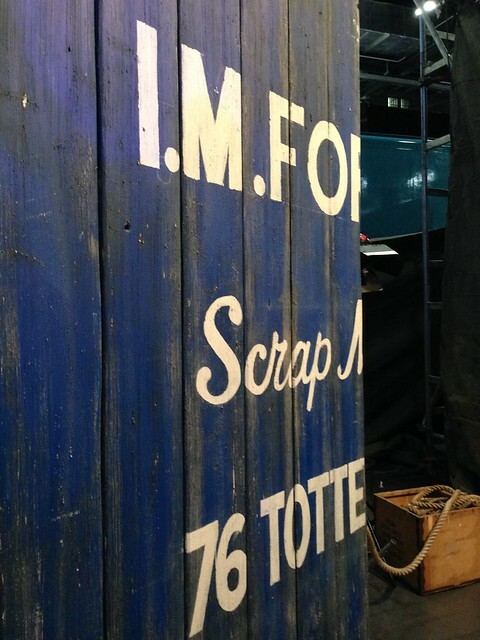 We stepped through the gates, which had been left ajar, to find the TARDIS parked amidst the scrap. A curious thing to be found in a scrap yard. It was wonderfully clever and drew gasps of admiration once people figured out that it was a ye olde TV set at the entrance! As a kid I often wanted to climb into the TV set and live in another world--and as an adult I often try to pull plates of food from Masterchef out of the TV--so this was just fantastic. After getting our bearings we pottered around and had a quick look at all the different stages and areas before we queued up for our TARDIS photo in Matt Smith's TARDIS! 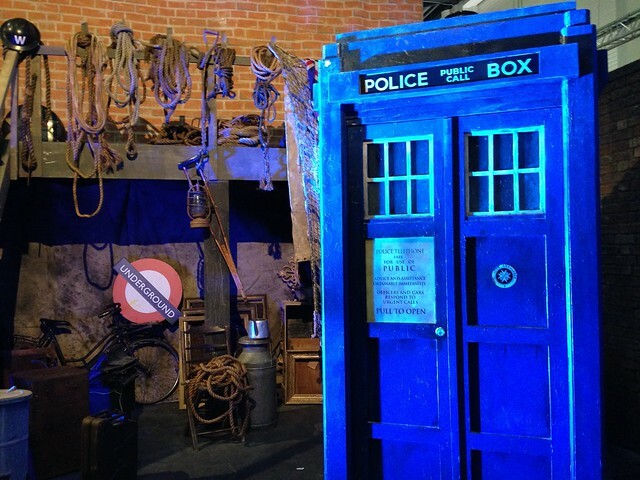 Excuse my complaining for a moment...but we were on the TARDIS set for about 45 seconds. In fact, we were pretty damn fortunate that all of us were looking at the camera at the same time!! 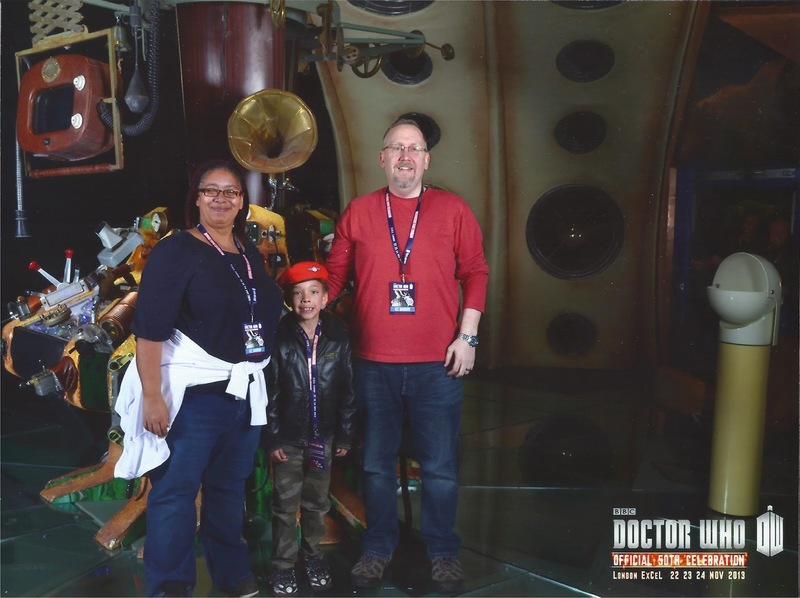 It was like being on a conveyor belt, a feeling echoed by the family who came through immediately after us; none of their kids were looking the right way and all the children were upset that they didn't get to look at the TARDIS at all. 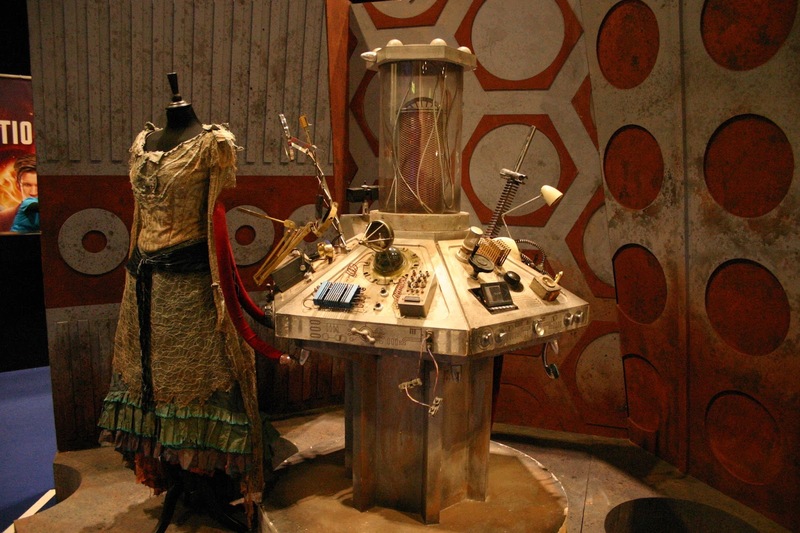 Talking of TARDISes, we stumbled across the Junk TARDIS from The Doctor's Wife. We could look at this one to our heart's content. 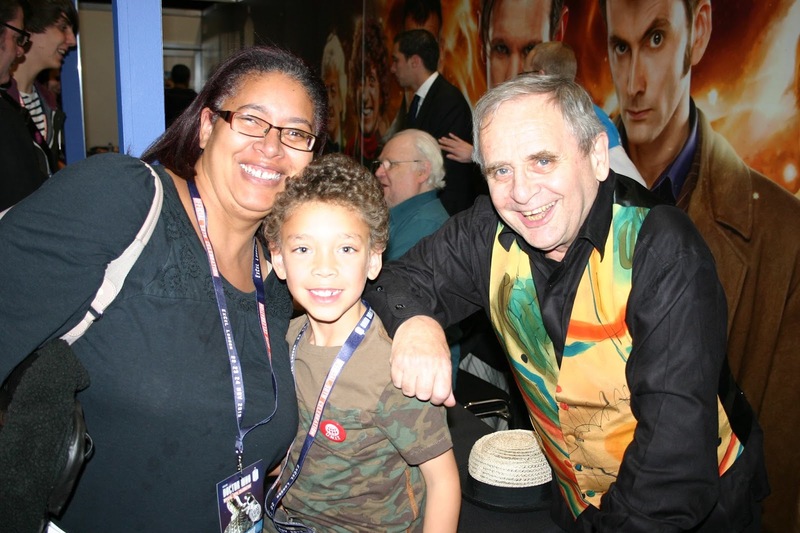 After another stint in a queue, we met Sylvester McCoy who was absolutely charming and very funny. 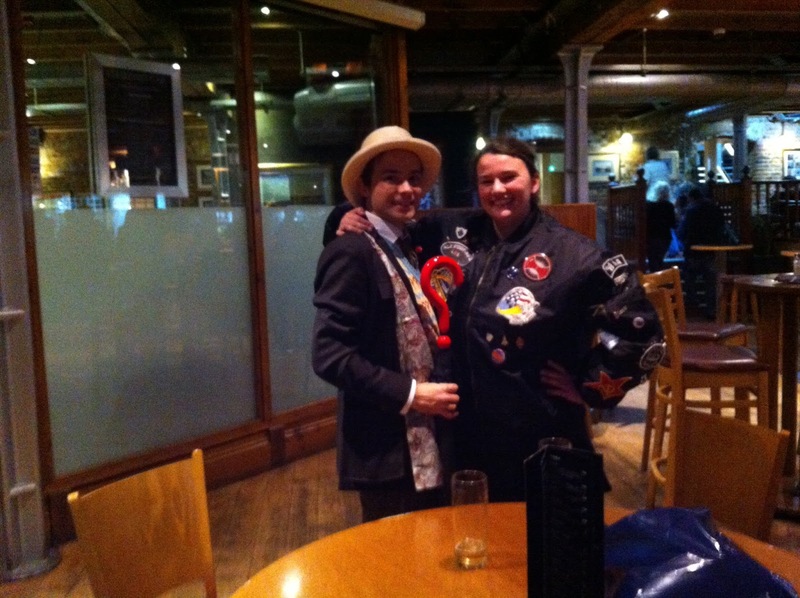 He brought Lucas right out of his shell and afterwards Lucas said that he'd changed his mind and that the Seventh Doctor was the bestest Doctor. What a good boy! 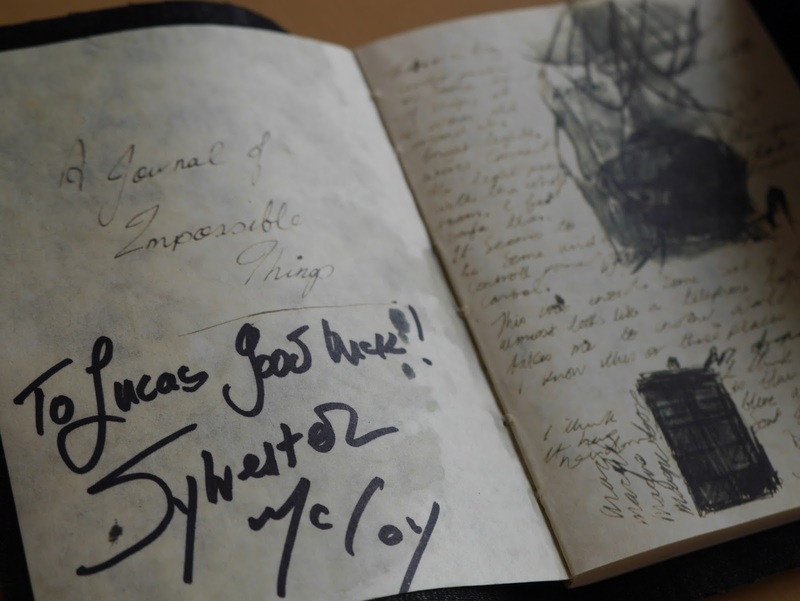 In a bit of a 'whoops' moment, Sylvester signed my Book of Impossible Things to Lucas rather than me, but I wasn't too sad about it. People are so easily charmed by the wee man after all! And then it was back to queuing for the next panel, which was Regenerations, aka the Classic Doctors. 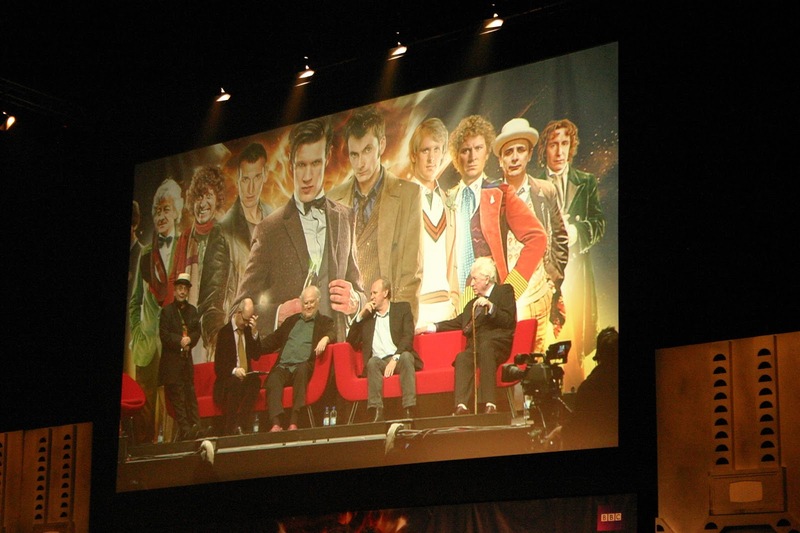 There was a standing ovation as each Doctor came out on stage. The applause and cheers for Tom Baker nearly blew the roof off! It was so wonderful to see him and to hear his anecdotes. I'll never forget it. All the Doctors had a wonderful rapport with each other, and it was brilliant to see them on-screen later on in The Five(ish) Doctors. If you haven't seen it, you should totally watch it right now! This was followed almost straight away by the Eleventh Hour (aka nuWho) panel with Matt Smith, Jenna Coleman and Steven Moffat. The cheers and whoops were almost as loud for this one! Everyone on the panel was dying to talk about the 50th anniversary episode but they couldn't--the anticipation was palpable! The next day's panels were much more raucous and exuberant judging from this video! Matt talked about how much he's loved playing the role and we were reassured that there was still a future for Clara and there was also talk about the casting of Peter Capaldi. We thoroughly enjoyed the panel and I came away a bit less sad about losing Matt and excited to see what Capaldi does with the role! I really, really wanted to love this weekend. I was so psyched for it, but the experience was spoiled by both the sheer number of attendees--24,000 spread over three days--and that there were too many conflicts in the schedule for you to be able to do everything you wanted to do even if you could get near the area. Maybe I'm just too British to get my elbows out and shove my way into the fray... I'm not sure that I'd go to another BBC event; event organisation just isn't their milieu. This is the first day of Blog Every Day in May. The official topic was "All about your blog" and I think that this--with the addition of some cake and loads of pictures of pretty scenery--pretty much sums me up!